This re-created vintage sign-off of the current CW Network affiliate for the Norfolk market is the product of YouTube user Video Bill, who's channel also has several other mid-1970s audio-only recordings of Norfolk-area TV station sign-offs. In the clip featured here, the audio is original, but the visuals are from pre-existing sources, as the intoductory graphic explains. The story of Channel 27 began in December 1953, when it signed on as WTOV-TV, a commercial independent station which shortly afterwards became an affiliate of the DuMont Network.  As with many UHF-TV stations in the 1950s, WTOV-TV had trouble generating viewers and revenue, and was forced to go dark in the fall of 1956. Five years later, an attorney-turned-minister named Pat Robertson bought the dormant station for reportedly less than $100 with a vision of turning it into the first TV station devoted entirely to Christian programming. The station was rechristened WYAH-TV (the YAH standing for Yahweh, the Hebrew name for God) and returned to the air on 1 October 1961. After several years of financial struggle, WYAH-TV gradually became a profitable independent family-friendly entertainment station by the time this sign-off recording was made, It was Channel 27 where the television careers of Jim & Tammy Bakker was launched, as well as Pat Robertson's own long-running program, The 700 Club. Robertson woul put Channel 27 up for sale, as well as his stations in Atlanta, Dallas and Boston, in the mid-1980s. Channel 27 was sold to Centennial Broadcasting in 1989, which changed the call letters to the current WGNT, standing for "Greater Norfolk Television". A more detailed history of Channel 27's days under Pat Robertson's ownership is view on the Wikipedia page for WGNT. The video commences with an inspirational film, Justice and The Circuit Rider, which this Webmaster has some faint memory of seeing a TV station ending its day with, though he remembers not which station it was. The U.S. Air Force "High Flight" film at the end was used by the ABC Network's owned-and-operated KABC-TV 7 in Los Angeles in the late 1970s and 1980s.